Simulator instructors can monitor trainees from any angle, including this point of view. Image courtesy CM Labs. IUOE Local 158, based in Albany, New York, represents heavy equipment operators, mechanics and surveyors in Upstate New York’s construction industry, a well as other engineers. It also has many members working in shops, quarries and airports, in addition to a growing number of public sector units. The IUOE has been representing operating engineers there for well over a hundred years, but during many of those years, training opportunities get frozen for at least four months out of every 12—with heavy winters being a standard in the Northeast. Asphalt contractors can relate. Previously, Local 158 was restricted to classroom learning from November to February, but now it has a virtual training yard available 365 days a year. Let’s take a look at the Vortex simulator from CM Labs Simulations. While the Local 158 doesn’t use the wheel loader training package, asphalt and aggregate readers will want to read about it here. Bill Gray, training director for Local 158 District 106 in Albany, said that training on the Vortex simulator is more convenient during heavy rain days, as an alternative to digging in the mud. Not only does the Vortex simulator open up new training possibilities, it’s also resulting in faster, more effective training for apprentices, Gray said. Gray believes that simulator training effectiveness is also enhanced by the reduction in stress levels—not just for instructors who otherwise would need to keep a watchful eye on novices operating hazardous equipment for the first time, but also for the trainees themselves. He points out that the simulator allows trainees to perform at their best: Operators who have had seat time in the Vortex simulator, with an instructor by their side, are safer and more productive in the long run, he said. The ability to swap machines is also a key consideration for the Local 158, as their training space is limited. The Vortex Advantage simulator itself includes the seating, controls, pedals, computers, and the hi-res screens—all as a single unit. The trainee’s view will be the same as the view from the cab of the actual equipment. As the first company to make swappable controls, CM Labs wished to make it easy to switch controls and pedal sets in minutes. Thus CM Labs’ full catalogue of heavy equipment training packs can be run from a single simulator. This includes training packs for various crane types, excavator, wheel loader, backhoe, motor grader and more. 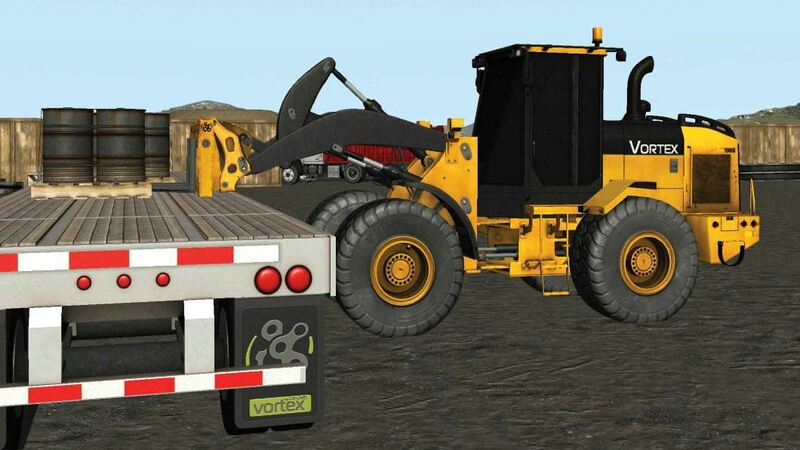 The Vortex software is designed to simulate the real behavior of cranes and earth-moving machines, including: rigging, cables, loads and soil behavior, all validated against empirical and engineering data. Vortex simulators also track and log performance metrics, such as cycle time, fuel consumption, pendulums, collisions, failure to protect others on the worksite and more. The wheel loader simulator training pack provides objective scoring of operator performance and abilities. Performance metrics include: collisions and shock loads; fuel consumption, cycle time, and idle time; and material excavated per bucket load and in total. Local 158 has had prior experience with simulators but the Vortex simulator is the one that provides the complex training required for operators to develop skills that transfer to the worksite.